The extent of the Danish claim (as presented by Denmark’s Foreign Ministry, the map in the actual submission is far more beautiful). 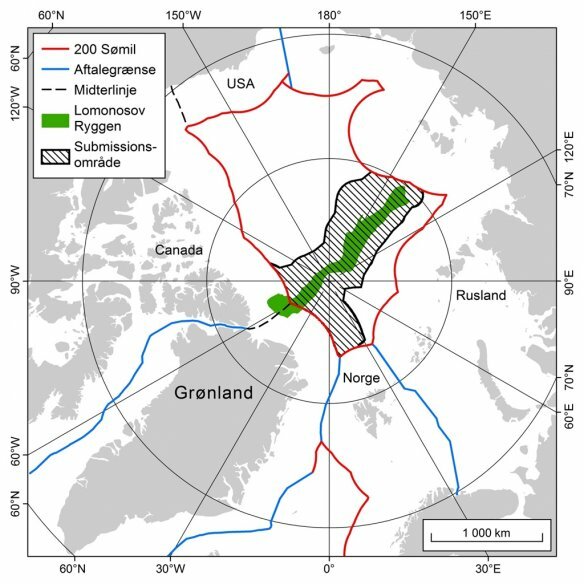 Denmark (together with Greenland) delivered on Monday the claim for expanding its continental shelf in the Arctic by 895,541 square km to the UN Commission on the Limits of the Continental Shelf (the impeccably prepared submission is filed on the UN CLCS website). The statement from the Danish Foreign Ministry is concise and precise – and does not mention the fact that the claim extends all the way to the limits of Russia’s continental shelf – and clashes directly with the long-declared Russian ambition for expanding its shelf. Russia delivered its claim back in 2001, but it was so poorly prepared that the UN CLCS returned it for substantiation. The issue had been quietly gathering dust up until the famous flag-planting expedition in August 2007, and since then, every year Moscow declared the intention to re-submit the claim, but has not delivered on the great many high-level promises. There was a point in this procrastination – it made perfect sense to coordinate this submission with Denmark and Canada so that there would be no conflict between claims; but as of now this point is gone. Moscow cannot hope that UN CLCS would approve its yet-to-be-submitted claim, if only because the Commission never takes any decision on conflicting submissions. Instead of engaging in legal battles, Russia prefers to rely on the one argument that really maters – military might. A new Strategic Command Sever (the North) was declared operational on 1 December; it is the Northern Fleet that constitutes its main element, but two infantry brigades are in the process of formation for adding some land power. Nuclear cruiser Petr Veliky is conducting anti-submarine exercises far in the Northern Atlantic (in order to show the flag near the coast of Greenland), and Russian fighters (including modern MiG-31) are getting more and more brazen in the Scandinavian airspace. Russian officials are trying to downplay the significance of the Danish move, but the attempts to cover the fiasco in making a solid and convincing claim for the long-coveted Arctic shelf by increasing military activities are seriously damaging for the regional security.